This is not going to be your traditional Thanksgiving message. Instead, I am going to share my personal feelings about this time of year and buck the trend to stuff your inbox with “deals of the day” just so I can make a buck or two. Thanksgiving and this time of year, in general, is not an easy one for me. There are many reasons that lead me to dread the frantic effort to bring people that may not like each other together, prepare meals that give you indigestion and make you feel ill, and, of course, rack up debt by purchasing gifts that may or may not be welcome. For me, it is all too much. That doesn’t mean that I am not thankful for many things, but rather that I make Thanksgiving and the holidays more personal, with a private bucket list of things to do and to be grateful for. For that reason, I tend to hunker down on this day and spend time on this day doing things I love and to heck with obligation and tradition. But that is just me. Perhaps your circumstances are different. Does this make me antisocial? Perhaps, but read on. It is that time again. My goal is to get a copy of my ebook in everyone’s hands for free. 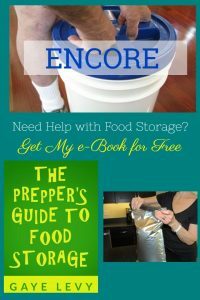 With that in mind, I am once again offering my eBook, Prepper’s Guide to Food Storage, for free. The dates are Feb 1-5 (Friday through Tuesday). I know that many of you already have a copy but if not, feel free to snag one now. Even better, if you know someone who needs help with their food storage, send them a link so they can snag a free copy as well.